Built in 1877, Kingston Prison is a prime example of the ‘panopticon’ radial prison design that found favour in the late 19th century. The idea was that prisoners, housed in radiating cells, could be observed from a central rotunda. Closed as a prison in 2013, the building’s cell wings, chapel and infirmary will be re-modelled for residential use, with new-build, low-rise apartment blocks located to the edges of the site. The former prison’s listed walls will be retained and its gatehouse redeveloped, incorporating a café. The landscape vision for the scheme is a key part of its identity. 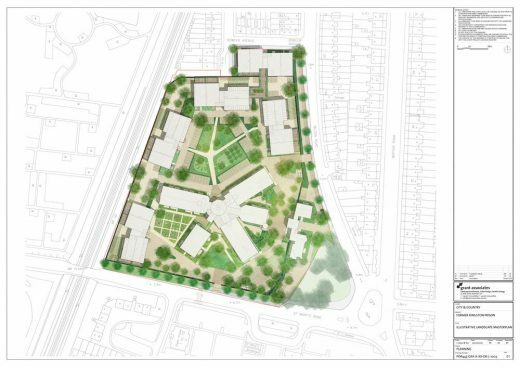 Grant Associates’ design concept considers the landscape as primarily shared space, bringing residents together and assisting, where appropriate, pedestrian movement through the site. 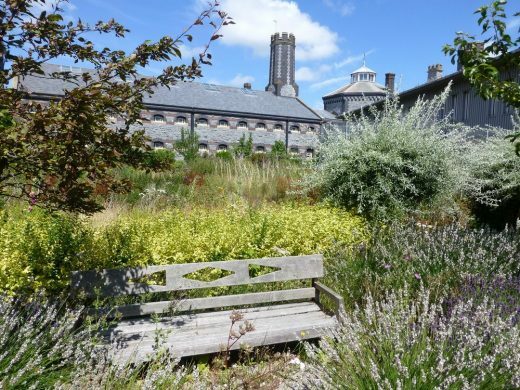 Adjacent to the existing prison building, a series of enclosed courtyard gardens will be created in response to the strong radial geometry of the site. These gardens will incorporate the commanding presence of the stone-built boundary walls, creating a unique landscape identity for the site inspired by the traditional walled garden. Rain gardens to be located around the perimeter of the Central Garden Square provide a catchment for rainwater runoff from paved surfaces and roofs. Plants tolerant of wet conditions will be used in these areas to create a new wildlife habitat, exploiting the site’s conditions. Extensive tree planting of various species will help create and frame key views and vistas throughout the site, adding to the landscape character, as well as the ecological and amenity value of the site. The design team will now commence the post-planning stage for the scheme, which is owned by developer City & Country. 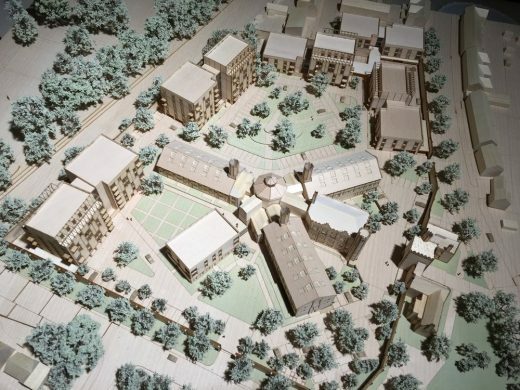 John Dawkins, Associate at Grant Associates, commented: “The landscape strategy is a key aspect to transforming people’s perception of this former prison site, and creating a beautiful setting for residents’ homes. “Guided by the concept of ‘Living in a Garden’, the strategy emphasises magnificent planting and horticultural excellence within a series of garden ‘rooms’, each with their own character. The different planting communities and groups will provide a rich and stimulating environment for residents and visitors to enjoy across the seasons.